For some time now there have been some odd matches, or lack of matches, in the mtDNA match list of many genetic genealogists due to the way genetic distance is calculated. Family Tree DNA, as part of other hardware and software changes, has fixed this problem. The fix will soon begin showing up in our match lists. This was announced along with the recent changes made to the algorithms used for Family Finder matches. Everyone who has taken an mtDNA test should check the match list in the coming days in case your list has changed. Here is wishing all of us see some exciting new DNA information with this change. Debbie Parker Wayne, "mtDNA Match Fix for Genetic Distance at Family Tree DNA," Deb's Delvings, 26 May 2016 (http://debsdelvings.blogspot.com/ : accessed [date]). I remind researchers in my presentations that we are still at the cutting edge of DNA technology and genetic genealogy, or the bleeding edge as my techie friends phrase it. As we learn more, we change algorithms and techniques to incorporate the new knowledge. I don't expect the advances in genetics to slow down for quite some time so, as Bette Davis said in All About Eve, "Fasten your seat belts, it's going to be a bumpy night." Although for us it won't be just a night, it will be months and years. Most of the bumps should also be major improvements, as is the one discussed below. Experienced genetic genealogists and test-takers have been asking Family Tree DNA to modify the thresholds used to determine DNA matches in the company database. The company delivers on those changes with this announcement. You asked for it - we listened! ... the following changes will have been implemented to the matching program. No minimum shared centiMorgans, but if the cM total is less than 20, at least one segment must be 9 cM or longer. If the longest block of shared DNA is greater than 9 cM, the match will show regardless of total shared cM or the number of matching segments. The entire existing database has been rerun using the new matching criteria, and all new matches have been calculated with the new thresholds. Most people will see only minor changes in their matches, mostly in the speculative range. They may lose some matches but gain others. We're excited about this update and hope you will be, too. If you have any questions, please let me know. Additional information was included in a message to all group administrators. Until now the amount of shared DNA required for two people to show as a match was a minimum of 20 total centiMorgans of shared DNA with a minimum longest block of at least 7.69 cM for 99% of testers, 5.5 cM for the other one percent. With the adjustment, if two people share a segment of 9 cM or more, they will show as a match regardless of the number of total shared cM. However, if there’s not a block that’s 9 cM or greater, the minimum of 20 shared cM with a longest block of 7.69 cM applies. Blaine T. Bettinger, “Family Tree DNA Updates Matching Thresholds,” The Genetic Genealogist, 24 May 2016 (http://thegeneticgenealogist.com/2016/05/24/family-tree-dna-updates-matching-thresholds/). Rebekah Canada, "Coming updates from Family Tree DNA! 25 May 2016," Haplogroup (http://www.haplogroup.org/coming-updates-from-family-tree-dna-25-may-2016/). David R. Dowell, "More Family Finder Matches?" Dr D Digs Up Ancestor, 24 May 2016 (http://blog.ddowell.com/2016/05/more-family-finder-matches.html). Roberta Estes, "Family Finder Matching Thresholds Changing at Family Tree DNA," DNAeXplained, 24 May 2016 (https://dna-explained.com/2016/05/24/family-finder-matching-thresholds-changing-at-family-tree-dna/). Debbie Kennett, "New match thresholds for Family Tree DNA’s Family Finder test," Cruwys news, 24 May 2016 (http://cruwys.blogspot.co.uk/2016/05/new-match-thresholds-for-family-tree.html). 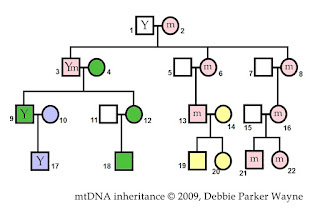 Judy G. Russell, "FTDNA changes matching system," The Legal Genealogist, 24 May 2016 (http://legalgenealogist.com/blog/2016/05/24/ftdna-changes-matching-system/). Debbie Parker Wayne, "Updated Threshold Values for Family Finder," Deb's Delvings Blog, posted 26 May 2016 (http://debsdelvings.blogspot.com/ : accessed [date]). Family Tree DNA sent the notice below about a great sale that includes the full mtDNA sequence that I have been recommending in my presentations. With the $99 regular price for Family Finder, this sale means the full mtDNA sequence is only $129. This is a great deal, especially considering this test alone cost $850 a few years ago. Family Finder is the autosomal DNA test that can find cousins on all of the test-taker's ancestral lines. 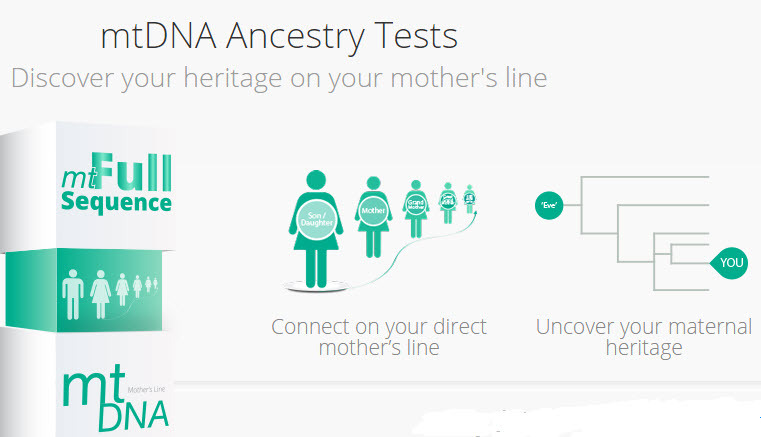 The mtFull Sequence finds others who share the same matrilineal line—the line from the test-taker to his or her mother to her mother to her mother and so on back to mitochondrial Eve. We are excited to begin our 3-day Mother's Day Sale! In honor of all of the Mothers around the world, we want to show our appreciation by celebrating this holiday with a special promotion on our Family Finder + mtFull Sequence (mtDNA) bundle – two genealogy DNA tests that focus on mom – for only $228! Our Mother's Day Sale will continue through Sunday, May 8, 2016 (11:59 PM U.S. Central). 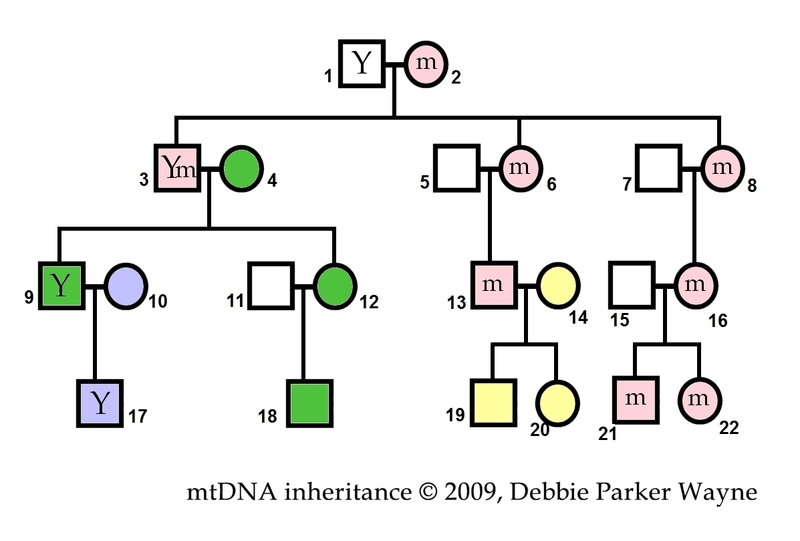 In the chart below, each person with an "m" and a pink shade inherited mtDNA from the mother of the woman labelled as number 2. 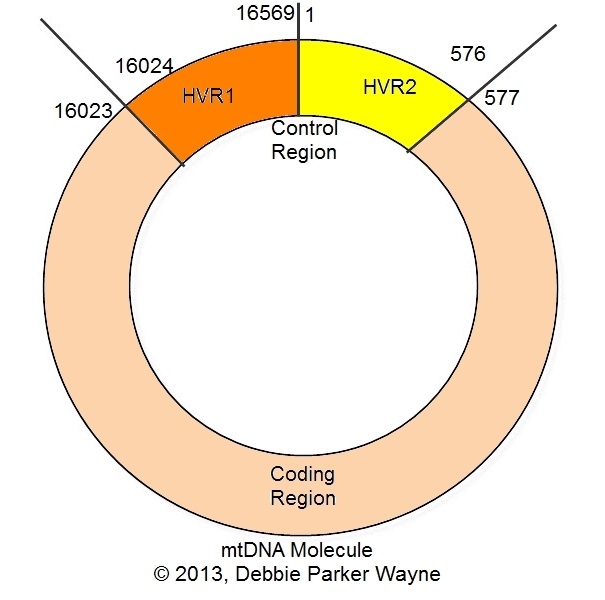 Other colors indicate mtDNA inherited from women who married into the family. Determine who to test by starting with the focus woman of interest, then following the daughters to a living person. The living person can be male or female but must have a line of only females back to the focus person. 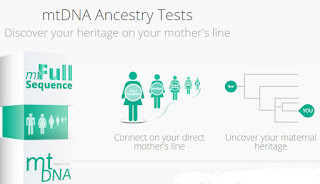 Debbie Parker Wayne, "Mother's Day DNA Sale at Family Tree DNA," Deb's Delvings Blog, posted 6 May 2016 (http://debsdelvings.blogspot.com/ : accessed [date]). 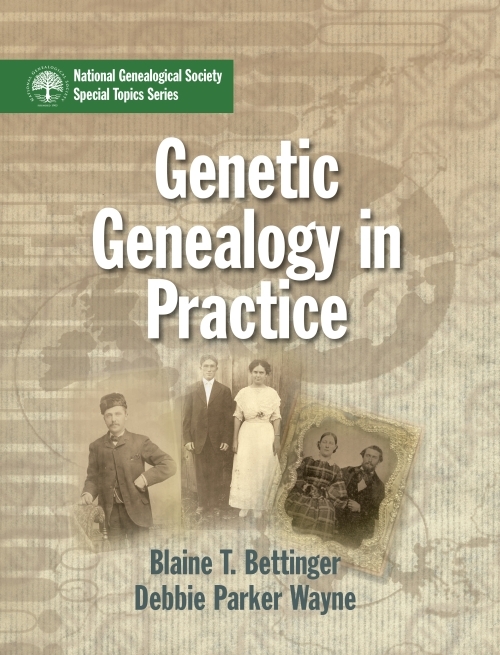 Added after initial post: See Blaine's post at http://thegeneticgenealogist.com/2016/05/03/announcing-genetic-genealogy-in-practice-a-new-book-providing-genealogists-with-the-skills-to-understand-and-apply-dna/ — Announcing “Genetic Genealogy in Practice” – A New Book Providing Genealogists with the Skills to Understand and Apply DNA. See the NGS announcement at http://upfront.ngsgenealogy.org/2016/05/coming-soon-from-ngs-genetic-genealogy.html. Bettinger, Blaine T. and Debbie Parker Wayne. Genetic Genealogy in Practice. Arlington, Va.: National Genealogical Society, 2016. Blaine and I have been planning for and working on this book for almost two years. After our week-long genetic genealogy courses at the Genealogical Research Institute of Pittsburgh (GRIP), Institute of Genealogy and Historical Research (IGHR), and Salt Lake Institute of Genealogy (SLIG), students want more hands-on time to practice what they have learned. Teaching important concepts limits the time available to devote to exercises. This book provides new and real genealogical problems those students, and all researchers, can practice on at their own pace. After mastering an application, the knowledge can immediately be applied to your own family history project. We think this book brings together the genetic and the genealogy concepts and techniques needed to solve family history problems using DNA as one more tool in the genealogy toolbox. We hope you enjoy the book and learn more about genetic genealogy. Our goal is to see more researchers effectively using DNA in a family study and publishing those findings for all genealogists to learn from. P.S. An aside for my family, the middle photograph on the book cover is Allie Perry Richards and Emma Everette Johnson (Granny and Pappy to me) on their wedding day, 23 June 1912. The Johnson family lived in Angelina County; the Richards family lived in Nacogdoches County; and the marriage took place in Sabine County, Texas. Added 12 September 2016: For a list of chapter titles and topics see 'Genetic Genealogy in Practice' topics and sub-topics. Edited 14 September 2016: changed publisher place to Va.
Debbie Parker Wayne, "New Book Coming Soon: Genetic Genealogy in Practice," Deb's Delvings Blog, posted 3 May 2016 (http://debsdelvings.blogspot.com/ : accessed [date]).